The BoBunny Blog: So many uses for BoBunny blossoms! So many uses for BoBunny blossoms! Blossoms!! There are so many things you can do with BoBunny Blossoms! 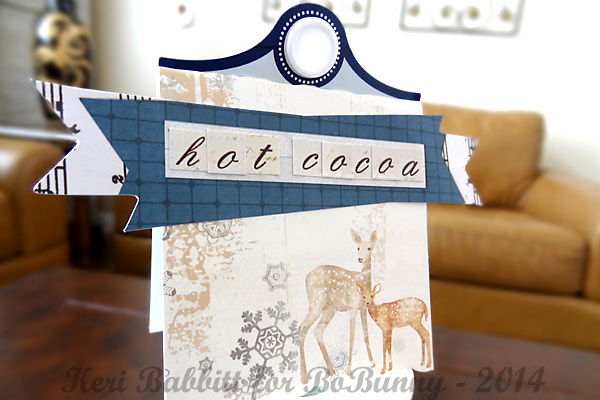 In fact, we are dedicating this whole week to showing you different ways to use the BoBunny blossoms! Since Valentine's Day is just round the corner, here are some packaging ideas using BoBunny's gorgeous blossoms with the fun Head Over Heels collection. If you think your packaging is lacking something or is a bit boring, try adding a flower or two to it. This will make your packaging so much more delicate and sweet! BoBunny Blossoms are such a great way to dress up party supplies. 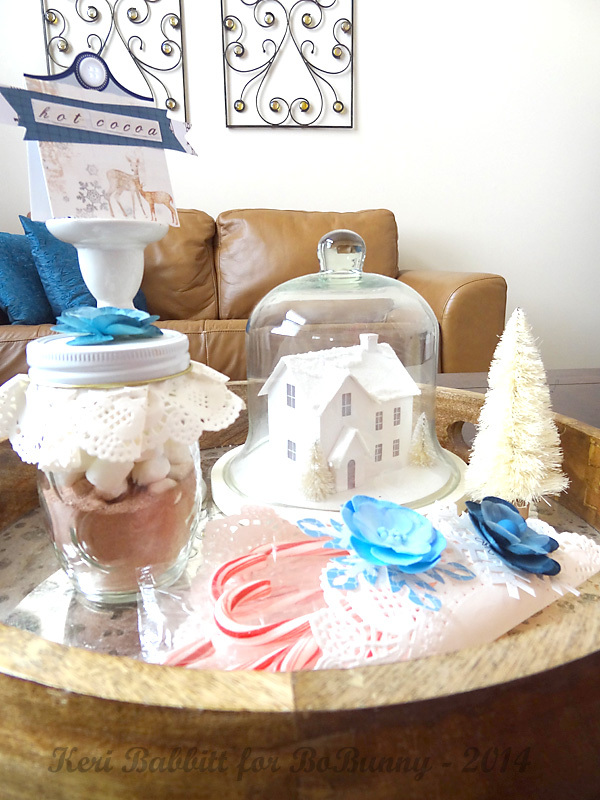 For a hot-cocoa-bar winter party, I topped a small jar with doilies and a blossom, after filling it with hot cocoa mix+marshmallows. I folded some larger doilies to create a quick container for the candy-cane stirrers, and adorned them with some layered stickers & blossoms. 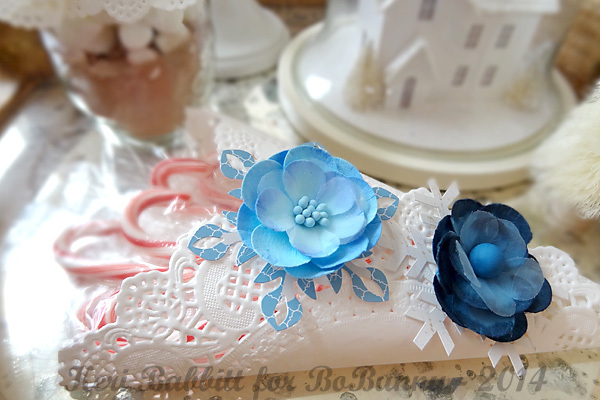 These blue flowers are so gorgeous, and really add an elegant, wintry touch to my party decor. 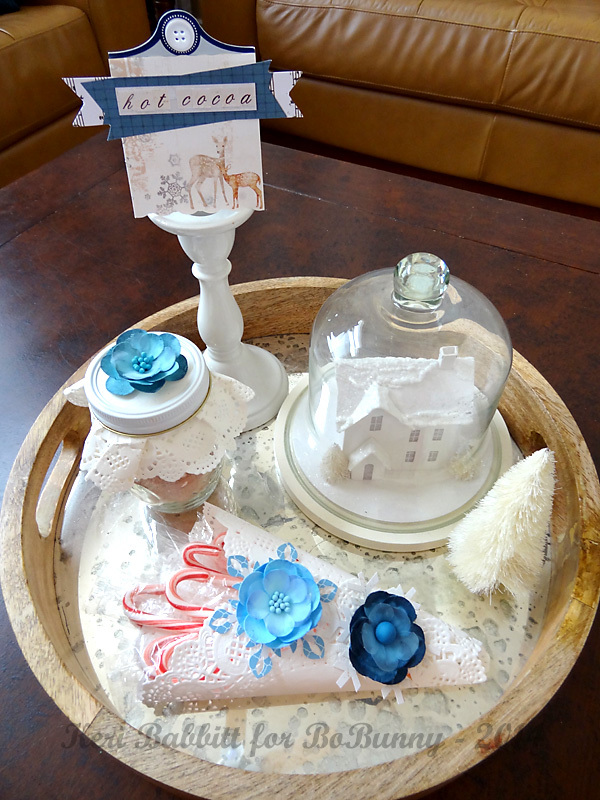 Designer's Tip: Use product packaging to make some easy labels for the party table. BoBunny Blossoms are so very versatile. I was inspired by some head bands that were being used as props at a photography studio. I wanted one for myself. I went through my sewing stash, pulled out some cord elastic, BoBunny Burlap Pleated Lace and a needle and thread. Then I picked out my flowers. 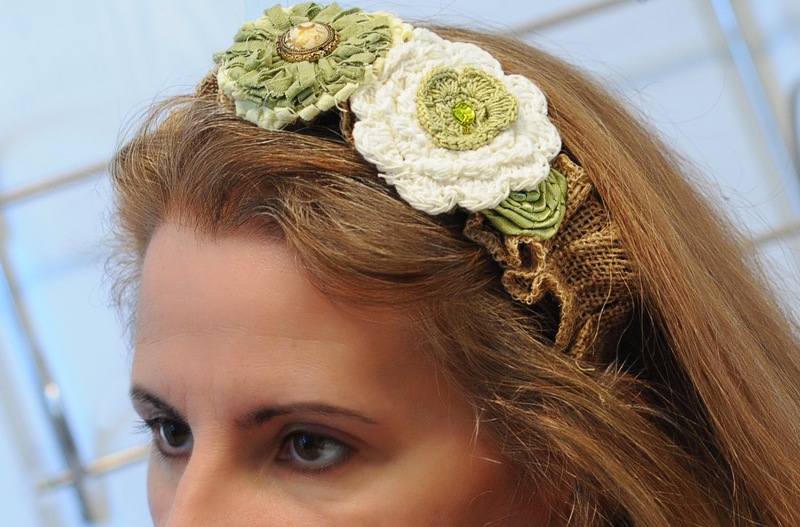 I thought the Burlap Pleated Lace would make the perfect base for my headband. I cut a length of the burlap, attached 2 pieces of elastic cord to the ends and sewed them to the ends of the burlap. I wrapped and hot glued small pieces of burlap over the ends to cover the raw edges. It was a very simple project using the wonderful BoBunny Burlap Pleated Lace and Blossoms. LOVE LOVE LOVE BoBunny Blossoms!! !